Planting and care are the main subjects of this website. Actually we should "creep into the skin of the plants" and "identify ourselves" with them to find out what their needs are for a healthy growth and fine flowering. And as with all living creatures it depends on their specific circumstances. You find these aspects on the left side of this page. To prevent you from scrolling too much, I split up planting and care in 2 pages with repeated index. My advise is, to take your time to read these comments to help you to enjoy your plants for many years without too much work. 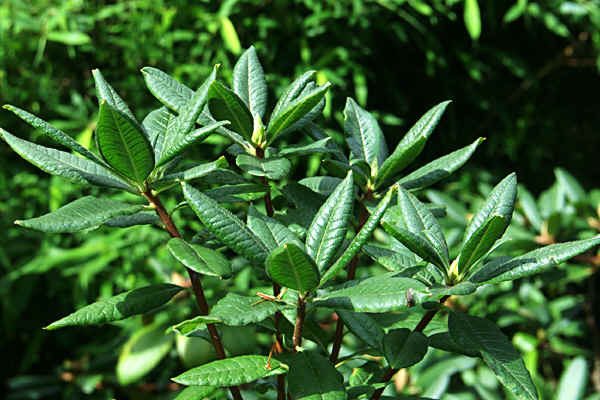 Everything is connected with everything - rhododendrons, growing and flowering fine and with the right soil and fertilizing will not easily have diseases or pests. The more sunlight most hybrids get, the better they will harden off with a better frostresistance. 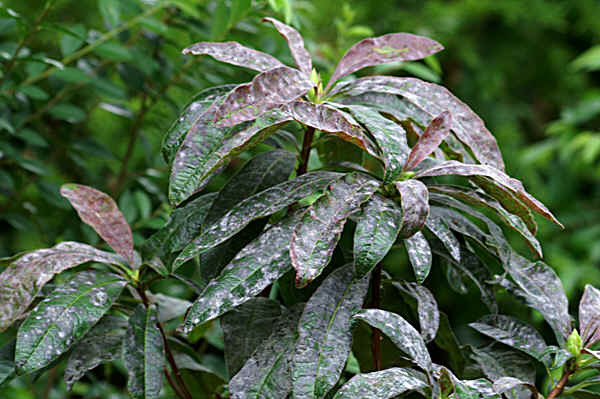 Heavy shadow makes a rhododendron grow leggy with less flowers, but a large-leaved rhododendron does not tolerate a lot of sunlight, so the place where you plant it is very important. If the fall season is very wet, growth can go on for a long time and the plant will not harden off as it should. Early frosts can damage the plants. Climate and how much rainfall is also important. Also with high rainfall the fertilizer will wash out, the colour of the leaves will be lighter yellowish green and the plant will have poor growth. So, the quantity of rain has a lot of consequences for the plants. If the soil is not good for the rhodos, and the drainage is poor, the roots will rot and diseases like phytophtora will take their chance. Quality of soil and rainfall are coherent aspects. 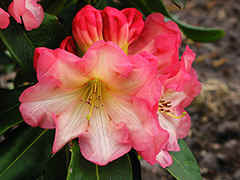 This all does not mean that planting and care of rhododendrons and azaleas is very complicated. Certainly not if you follow some basic principles. Just read the tips and guidelines below how to enjoy these wonderful plants many years without trouble!! B. Where do you want to plant them considering sun and wind. C. How big will they be after some years? How much shade or shelter? D. How big will the rhododendrons and azaleas be in about 10 years? Or even later. E. The combinations of colours. F. Different soils for different locations and plants. A+B: I suggest that you also want to plant trees, shrubs, grasses, ferns, perennials etc. Then you have to bear in mind the wind- and sundirection and how big the plants will be in some years. Important is protection from cold dry winds in wintertime. Some trees are a fine compination with rhodos, but their shallow roots compete with the roots of rhododendrons. For example don't plant them too close to birches or most firs. They will take away the moisture and food . Oaks and pines are rooting deeper and better in combiantion with rhodos. Using bamboos is like asking for trouble, because most of them grow rank if you don't close them up. Many conifers like Thuja and Chamaecyparis are providing protection against winds and are a beautiful background! All this also depends on the climate where you live. West (best? )coast or East coast of the USA is very different! And Massachusetts is not the same as Georgia! C. Planting the rhododendrons and azaleas not too close to each other and other plants means, that you don't have to replant them after some years. It is better to fill up the open places with other Ericaceae, like Kalmia, cranberries, heathers etc. or dwarf conifers. E. I know some (female) gardeners, who are very keen on planting the right plants with the right colours on the right place. As far as I know, nature does not. They prefer soft hues, and don't like (too) cvivid colours, because they draw the attention too much. Well, everyone has his own taste - I like bright colours. F. What do you want: a garden with (some) rhododendrons, or a rhododendron-garden? In the first case, so also many other plants, you have to make a plan where to plant the rhododendrons and azaleas and improve the soil if necessary. You can do this in certain sections or spread throughout the garden. I like winding paths with sections where I plant conifers, bamboo, trees and shrubs, keeping in mind where to plant the rhodos and azaleas. Where I live now, I had to consider the strong winds from the west, which especcially large leaved rhodos don't like!! So I had to plant trees and conifers there for wind protection. If you bought a house with an existing garden, you have to plan where to plant rhodos and how to improve the soil, if needed, and which plants you want to remove and exchange with rhodos and azaleas. Then the question is, how strict you want to do this. Firm or a bit unorganized. After some years you can see, that rhodos and azaleas have grown too big or too close together. You can plant them wider or remove poore growing and flowering rhodos, and plant small plants in between, like heathers, gaultheria, vacciniums etc. The time to plant rhododendrons and azaleas is quite long, being the best in fall and early spring. It depands also on your climate. As long as it is not freezing or really hot in summer, you can plant. Planting material in active growth is not advisable. So, let's say, that in climate zones of 5 and 6 the best planting time is from September till November, and from April. till-mid May. In the zones 7 and 8 the best time would be October till mid-December and March till April. Planting in warmer periods means, that you have to water more frequently. Then it is also necessary to plant the whole rootball if any possible. 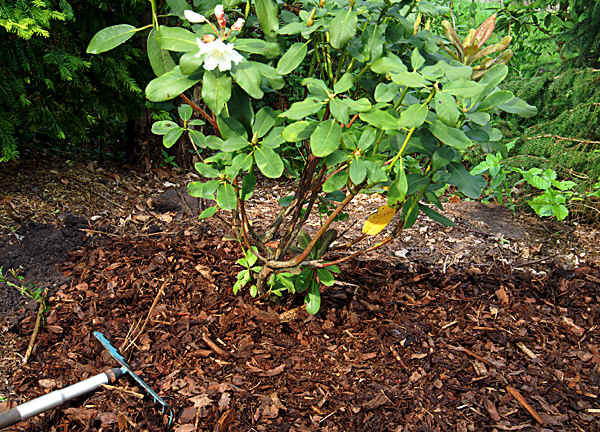 Plus, that mulching is very important in that time to prevent evaporation of the water. Anyway, mulching is a main issue for the benifit of the plants and yourself! If you buy a plant in flower, which is a good thing to see the plant in flower, you should take more care in watering to keep the flowers in good shape. Providing a bit of shade in case of a very sunny location will also be a good help. Now you can see the real colours of the flowers and make a good combination. Most colour labels will fade with time and do not indicate the right colour! 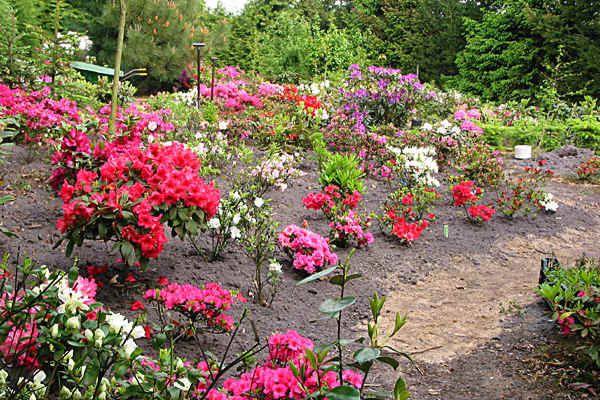 After your decision where to plant the rhododendrons and azaleas you have to take the right measures for the soil. When the soil conditions are good already, it is a matter of digging a hole about 3 times the diameter of the rootball and not deeper than 15 to 20 inches. It is always good to mix the soil with all kinds of organic materials., like shredded oak leaf mold, decomposed pine needles, pine bark etc. If you add pure peat it must be mixed with the surrounding soil. 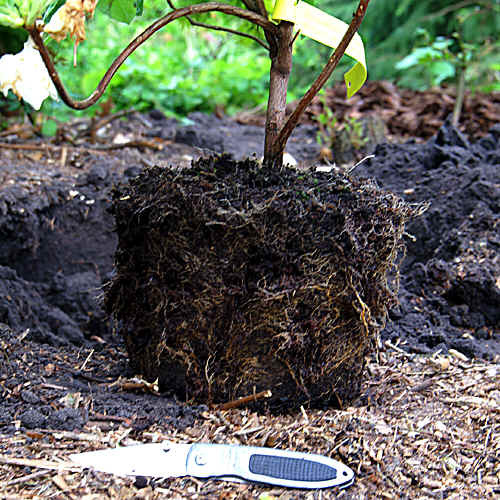 Never plant in pure peat - it is too acid and has no nutrients. In case, that the soil conditions are not so good, it is even more important to mix all these organic materials and may be also some sand, and loosen the surrounding soil. See below: "Soil conditions". Don't plant the rhodo deeper than it was or in the pot. Now you put the plant in the hole, water well and add the soil mix and tread down the soil, but not too heavy. Rhododendrons need oxygen in the soil, so the soil must be vaporous. When you have problems with drainage, you can put a bucket full of water in the plant hole, and if it takes more than 15 minutes that the water soaks away, the drainage is not good enough. Then you have to dig a deeper hole, and put stones or coarse organic materials on the bottom for better drainage. Now you have some soil left, you can make a channel around the plant for later watering. Plants grown in field soil have better chances to perform well than grown in containers. These plants have build up a root system that encircles the rootball. They have a tendency not to grow further in the surrounding soil. Now the outer roots of the rootbal should be cut or loosened up with a knife or fork. See picture (link) on the left side. And of course the rootbal must be wet, because it is hard to water a rootball that is dry!! So, put the rootball in a bucket of water till there are no bubbles any more. 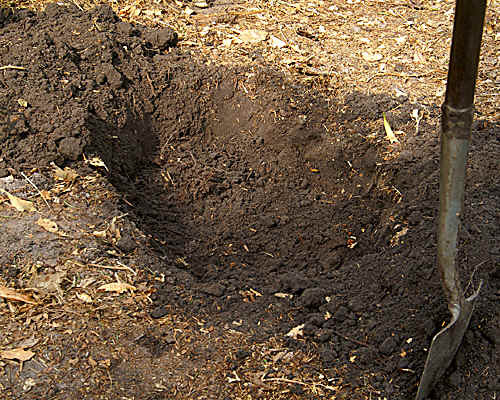 If you have (heavy) clay soil, the drainage will be bad, do you have to plant on the soil, place logs around it and fill the space with the mix of good soil as described above. In this case it is even more important to mulch and water well in dry periods. C. the soil must be able to hold and keep moisture, so, not dry up. A. Rhododendrons and azaleas grow best in soils with an acidity, PH, between 4 and 6. 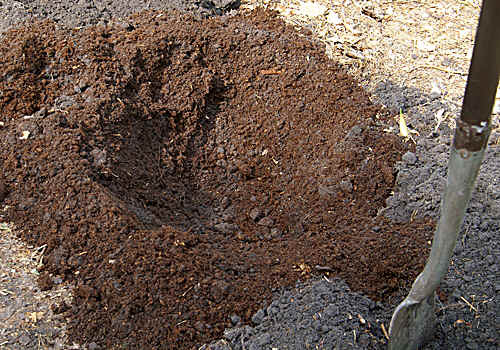 In this soil the plants can pick up nutrients, minerals and trace elements like sulphur, magnesium, cobalt, copper, etc. If the PH is (much) higher the plants can't pick up iron, for instance, and then you can use chelated iron, but why do so, when you can improve the soil without these tricks! We have to imitate nature and provide the plants with the ingredients they need. We have to make the soil better with organic materials as described above. Often the same material as we use for mulching. In my garden I have quite dense soil with very fine particles, and after a lot of rain the rhodos have some problems with it. So I had to add a lot of organic materials to improve the soil. And it helps. B. 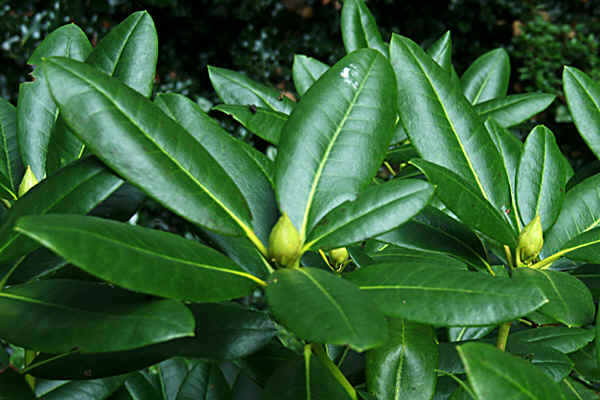 Why does a rootball of a rhododendron not grow deeper than about 20 inches? The reason is quite simple - at deeper levels the soil can't hold enough oxygen for the roots of the plant, and there the roots will not grow or just die! Therefore we have to mix with organic materials which let the soil 'breath'! Just like us! C. Because a rhodo does not root deeper than 20 inches, it can only take the needed water out of the layer of soil of this depth! In long dry periods the plant takes the moisture out of the rootball till there is no moist in it. So, when you water, don't do it for a short time, but long enough, so that also the lower level of the soil gets wet! Otherwise this layer will die and has no function anymore! This does not mean that you should overwater the plant till it is soaked in water. In hot periods this can cause diseases like phytophtera. A lot of organic material can hold the water for a longer time. And don't forget to mulch - essential!! Rhododendrons grow best in the climate zones 5 to 8. Zone 5 is -15 to -20 F, (-29C tot -23C). Zone 8 is 15 to 20 F, ( -12 tot -7C). Here are more or less the limits. I know that in some parts of the USA and Finnland some 'Ironclads' can be grown even in zone 4. In Finnland hybridizers have bred Rhodos that can stand temps of zone 4 or even 3b. Till -30 to 35 F. (= about -40C) For decidious azaleas the situation is a bit different, they loose their leaves in fall, and many can stand zones 5 or even 4.Native azaleas in the USA are doing fine in some areas, not in others. I know of problems of growing the R. occidentale in Eastern USA. (East or West - what is the Best? :-) Evergreen azaleas can't cope with these low temps, but can stand better high temperatures (to zone 10) than the big leaved rhodos. (see USDA Hardiness Zones on the internet) Another thing is, that a certain zone does not mean everything - zone 8 in the UK is very different from zone 8 in the USA. In the Uk there are hardly such long and hot summers as in Georgia for instance. A zone indicates the lower limit of freezing, not (necessarily) the upper limit of the heat! A. If we have a long fall with in October and November a lot of rain and relatively mild weather, then the rhodos don't harden off well enough. It seems as if they think, that spring arrived already and the sapstream starts again wilth all the consequencies when it starts freezing suddenly! Another example: some evergreen azaleas don't grow well in Scotland, but here they do fine. How come? In normal summers they harden off well here in the Netherlands, but not in Scotland, because the summers there are not warm and long enough. Some years ago we had a warm October and I remember October 20 with 20 C, (almost 70 F). On October 30 we had frost of - 7 C (about 20 F). The results were desastrous with a lot of barksplit, frozen flower buds and frozen leaves, dropping of next spring. Fortunately this does not happen often. B. When fall is quite sunny and dry, the plants harden off much better - and when the frost starts moderately, there will be no damage. This means, that plants on a not-sunny location will not harden off so well and they might be susceptible to early frosts. Location, rainfall and sunlight are connected closely! C. Some advantages can have their disadvantages - A sunny location can be good for hardening off. 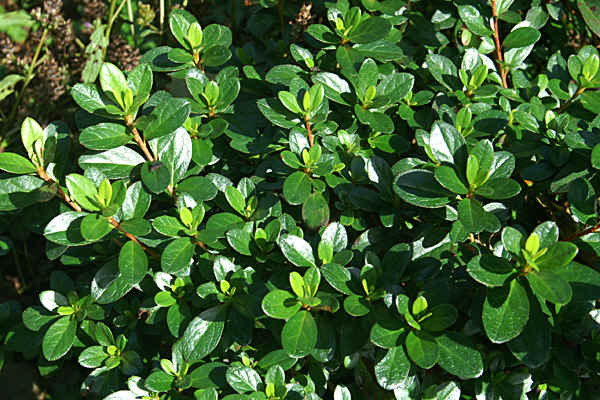 Okay, but evergreen azaleas in a sunny location in winter can die with strong cold winds and the sunlight. Together they can be the killing factor. Most of the time killilng by frost means that the leaves dry out, the plant can't provide itself with moisture, because the soil is frozen. Result: plant is (almost) dead. So, in this case there is a conflict between a sunny location or not. 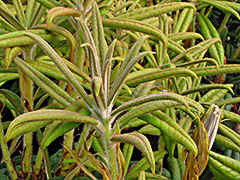 Then the evergreen azaleas need protection with fir-or pine twiggs or so. Another option and good tip is, to plant conifers like Thujas on the side of strong cold winds. D. Fertilization plays an important role in hardiness! So don't apply fertilizer after July. It may stimulate the plant into growth with killing in winter as result. You can apply potassium, Kalium, because it stimulates the process of hardening off. The question can arise why some rhododendrons are cold hardy and others not. Late spring frosts can be disastrous by killing the flowers or flower buds. Even with very hardy rhodos. Some hybrids have an early sap stream, others later. I don't want too many early flowering hybrids, because there will always be night frosts and irritation about killed flowers. Some years ago my wife Reini and I were laying blankets, curtains and all kind of sheets etc. over early flowering rhodos, but with our present garden of more than 4 acres and many hundreds of rhodos, we just accept the loss of flowers. You can take the line, that most of the rhododendrons and azaleas sold in your region, are cold hardy enough. Just see the offers of nurseries, garden centers etc. and gardens in your neighbourhood. An even better thing to do is, to become a member of a Chapter of the ARS or ASA in the USA, the RHS in the Uk or any rhododendron Society in your country or region. 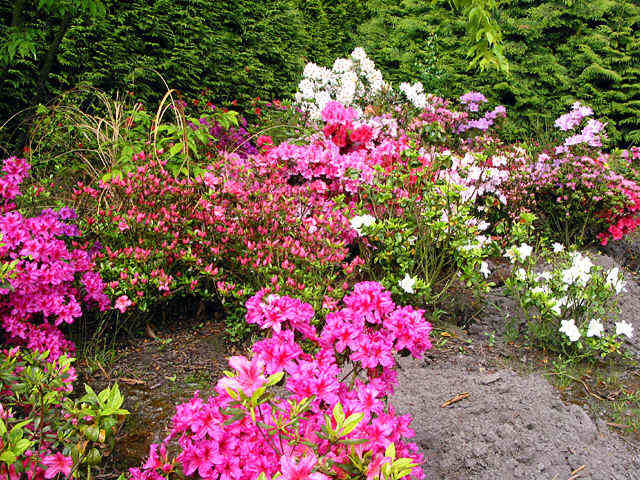 These members are enthousiastics and most experts on the field of rhododendrons and azaleas. 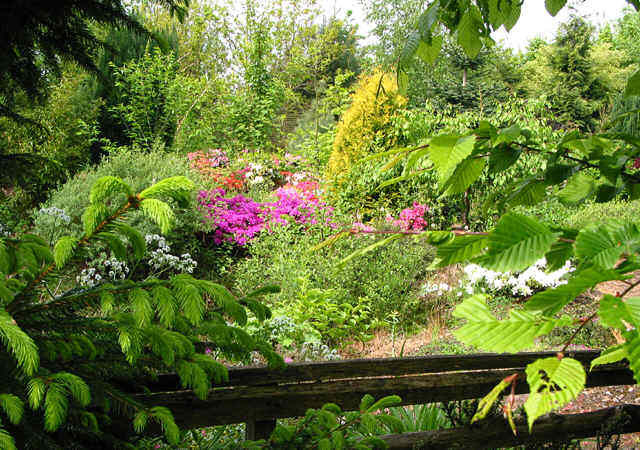 These societies also have lists of good-doers of Rhododendrons and azaleas in your region. In some garden magazines or advertisements I read that rhododendrons should be planted in shaded locations. Well, freely speaking, this is just nonsens. 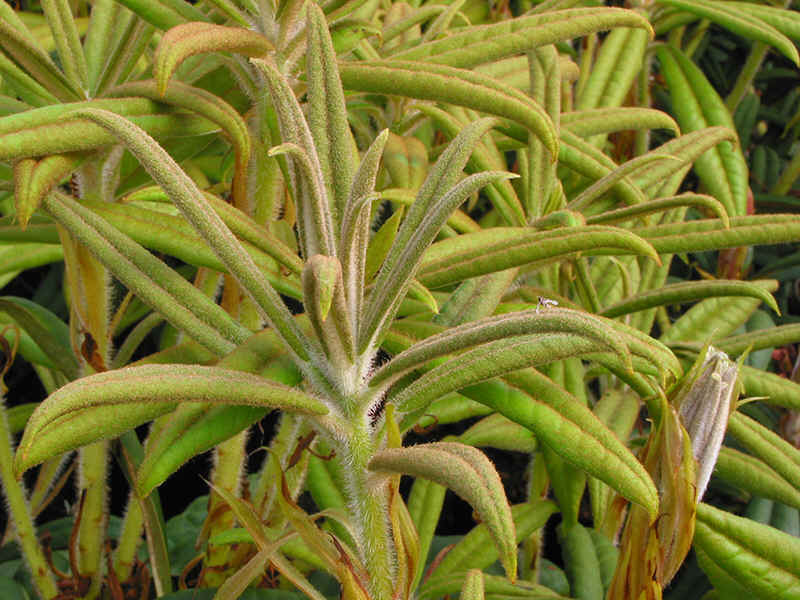 In dense shade conditions they will grow spindly and will hardly make flower buds. This also depends of the summer heat you have. The more bright sunlight, the more filtered light the plants require! Especcially in early afternoon they appreciate the filtering effect of some trees with the lower branches trimmed up. You will understand that this is different when you compare the conditions in Scotland with the southern states of the USA. Most of the evergreen azaleas and small leaved rhododendrons can cope with a lot of sun, under the condition of a moist soil! You can use the following rule: "The larger the leaves, the less sun they can tolerate"!! A large leave is about 5 to 10 inches, a very large leave more than 20 inches, like R. macabeanum or R. rex. Another connected thing is the flowering time of the rhodo or azalea. Late flowering plants need more (filtered) shade than early flowering ones. Otherwise the flowers will wither and the colours will fade!! Again - mulching is very important to keep the soil moist! The plants need it. Some species have developed a unique system to avoid loosing moisture in the plant itself by 'creating' a sort of 'felt', greyish, silky or even coppery coloured. This felt we call 'indumentum'. A well known example for this is the R. yakushimanum, which grows on the island Yaku Shima in Japan on elevations of more than 5.000 feet, (1.500 m). In full sun the plants will grow more compact and will have more flower buds. It's good to know that! Of course it is evident that you want to know the plant-size at maturity. When you buy a rhododendron or azalea you want to plant them on the right location - which mostly means the lower ones in the front and the larger ones in the back. On the labels there is an indication on the colours, but also the size after 10 years. So you can read f.i. 5 feet. In general conditions this means that the rhodo or azalea will be 5 feet high after 10 years. And after reading my story above you know also that in shady conditions with a lot of fertilizer the plant can be substantial higher! And in full sun with little fertilizer may be 4 feet. This is also true if you want to know the size after 25 years. And without (heavy) pruning of course. So, more or less you have it in your own hand. And it also depends in what location you plant the rhodo. As I stated before, don't plant them too close together. It gives you a lot of work after some years, when the plants have grown together. It's better to fill up the 'gap' with small other plants. And if you want to know more about care, just read next page! Good luck with your planting work. And enjoy your efforts!! "Practice makes perfect". 1. consider the right place for the plants considering direction of wind and sun; and other trees, not too close to birches and firs. 3. consider: "The larger the leaves, the less sun they tolerate"
4. improve the soil if necessary with organic matter like pine bark, shredded oak leaf mold, decomposed pine needles,etc. 6. plant them as deep as they were before - water the plants well the first year(s) and mulch. 9. plants sold in your region are mostly colld hardy enough - from other regions check! 10. become a member of rhododendron- and azalea societies, like ARS, ASA, RHS etc.